After getting your new SBI ATM Debit card at home through net banking, now you don’t need to visit your home branch for activation and ATM PIN. You can activate your new SBI ATM/Debit Card online and also get your ATM pin online using net banking. Today we will show you how to activate SBI Debit card online without visiting branch, this facility also available on net banking as well as SBI YONO application. In past, when you received your card, you need to visit your branch to activate your card and receive PIN. But now this facility become online, you don’t need to visit the branch to activate your SBI Debit card OR for the PIN. So let’s see how can you activate your New Debit card and generate PIN Online, the process is very simple and fast. I assume you received your card after applying online, now you need to activate it, after this, you can use it. 1: First login to your SBI Net banking account. Enter your username and password and login. 2: After login, you can see e-Services tab, just click on it open. 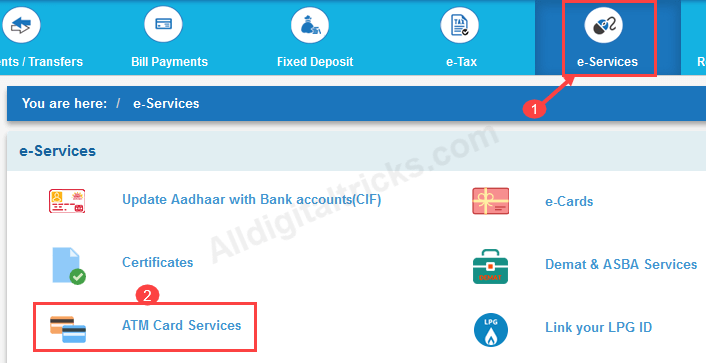 In e-Services, you can see many atm related options, you have to click on ATM Card services option. 2: ATM Card Services allows you to manage your card, here you need to click New ATM Card Activation. 3: Now enter your 16-digit number ATM card number, once again enter it and click on Activate. That’s it, your Debit card now successfully activated, now you need to generate PIN online. 1: You card is activated and now we need to generate PIN number. You can do this at ATM Card Services option. Open ATM Card service again and click on ATM PIN Generation. 2: Next screen you need to select Profile password OR OTP option to validate the account. Select any option and enter required password or OTP. 3: Next screen select your account number. 4: Now select your new card and click on submit. 5: In the next screen, just enter the first two digit of your desired PIN & submit. Now you will receive SMS of last 2 digit of your PIN on registered mobile number. Next screen enter your first two digits and enter last two digits which you received on your number. Now click on submit. That’s all you have successfully Generate your PIN number. Now visit any ATM machine and you can use it. Sp guys, this is the simple procedure to activate your SBI Debit card online and generate PIN online. Hello, to activate your debit card login to SBI Netbanking and follow above process. Customers can easily disable international transaction after using it through mobile banking. Also they can limit transactions to avoid fraudsters. i have just received my sbi debit card. i havent used / swiped it yet. i have the pre kit login and then its shown me invalud after typing several times. then i tried atm services there too my card number is wrong. im pissed.